Dendritic cells (DCs) are specialized APCs that can be activated upon pathogen recognition as well as recognition of endogenous ligands, which are released during inflammation and cell stress. The recognition of exogenous and endogenous ligands depends on TLRs, which are abundantly expressed in synovial tissue from rheumatoid arthritis (RA) patients. Furthermore TLR ligands are found to be present in RA serum and synovial fluid and are significantly increased, compared with serum and synovial fluid from healthy volunteers and patients with systemic sclerosis and systemic lupus erythematosus. Identification of novel endogenous TLR ligands might contribute to the elucidation of the role of TLRs in RA and other autoimmune diseases. In this study, we investigated whether five members of the small heat shock protein (HSP) family were involved in TLR4-mediated DC activation and whether these small HSPs were present in RA synovial tissue. In vitro, monocyte-derived DCs were stimulated with recombinant αA crystallin, αB crystallin, HSP20, HSPB8, and HSP27. Using flow cytometry and multiplex cytokine assays, we showed that both αA crystallin and HSPB8 were able to activate DCs and that this activation was TLR4 dependent. Furthermore, Western blot and immunohistochemistry showed that HSPB8 was abundantly expressed in synovial tissue from patients with RA. With these experiments, we identified sHSP αA crystallin and HSPB8 as two new endogenous TLR4 ligands from which HSPB8 is abundantly expressed in RA synovial tissue. These findings suggest a role for HSPB8 during the inflammatory process in autoimmune diseases such as RA. Dendritic cells (DCs)3 are professional APCs that regulate the delicate balance between immunity and tolerance. In the absence of inflammation, immature DCs (iDCs) reside in the periphery, highly capable for Ag uptake, which is largely arranged by FcγR and TLRs. Upon ligand binding, DC undergo maturation, which coincides with a down-regulation of Ag recognition receptors, up-regulation of MHC and costimulatory molecules, and production of proinflammatory mediators such as TNF-α and IL-12. To date, a large body of evidence points toward the crucial role for DCs in the onset and perpetuation of arthritis (1, 2, 3, 4). Many signals are able to induce DC activation, and among the most powerful of these are microbial and viral products, also called pathogen-associated molecular patterns, which are recognized by TLRs. Exogenous TLR ligands include lipoteichoic acid, LPS, CpG motifs of bacterial DNA, and viral RNA (5, 6, 7, 8). More recently, however, many studies addressed the role of endogenous ligands in the TLR-mediated cell activation (9, 10, 11, 12). Intriguingly, such endogenous ligands, including fibronectin, heat shock proteins (HSPs), hyluronic acid, and host-derived RNA, are released upon tissue damage and cell stress, events that are likely to occur during inflammatory conditions. The activation of cells by endogenous components from distressed or injured cells supports the so-called “Danger Model” proposed by Matzinger (13). This theory suggests that the immune system is more concerned with damage than with foreignness and is called into action by alarm signals from injured tissues, rather than by the recognition of nonself. In this light, it is tempting to speculate that an immune response to endogenous components plays a role in the initiation of autoimmune diseases. Accordingly, TLRs are implicated in the breakdown of tolerance as shown in experimental models of diabetes (14), Crohn’s disease (15), and multiple sclerosis (16, 17), and recent research suggested that simultaneous or sequential triggering of different TLR pathways might be the event that sets off autoimmunity (18). Rheumatoid arthritis (RA) is such an autoimmune disease, characterized by chronic inflammation of synovial joints leading to cartilage damage and ultimately total joint destruction. Although the exact pathways leading to the initiation and perpetuation of synovial inflammation remains obscure, recent evidence addressed the potential role of TLRs in arthritis. At first, TLR2, TLR3, TLR4, TLR7, and several ligands were found to be highly expressed in synovial tissue from RA patients, compared with that from healthy donors (3, 4, 19). Second, we have shown that TLR-mediated activation of DCs from RA patients led to significantly higher levels of the key proinflammatory cytokines TNF-α and IL-6, compared with DCs from their healthy counterparts. Finally, the involvement of various TLRs in the onset and perpetuation of experimental arthritis has been elegantly shown (20, 21, 22). These latter findings have sparked the research into the role of several endogenous TLR ligands in RA of which HSPs have been studied the most thoroughly thus far. HSPs constitute a family of proteins that carry out housekeeping functions that are important for the survival of eukaryotic cells. More recently, evidence emerged on a role for HSP during innate and adaptive immune responses (23, 24, 25). HSPs can be classified into several distinct families from which HSP60 (HSP60, HSP65, and GROEL) and HSP70 (HSP72, HSP73, and GRP170) have been the subject of extensive studies with regard to immunogenetic properties. The small HSPs (sHSPs), including αA crystallin, αB crystallin, HSP27, HSPB8 (HSP22), and HSP20, represent another class of HSP, ranging in size from 12 to 43 kDa (26, 27, 28). In contrast with the HSP60 and HSP70, the role of sHSP in autoimmune diseases have not been subjected to similar research. To characterize the potential role of sHSP in arthritis, in this study, we investigated the ability of five members of the sHSP (αA crystallin, αB crystallin, HSPB8, HSP27, and HSP20), to stimulate monocyte-derived DCs and the possible role for TLRs in this process. In this study, we demonstrate, for the first time, that the sHSP αA crystallin and B8 (HSP22) clearly induced DC maturation and cytokine production, which was TLR4 dependent. In addition, HSPB8, but not αA crystallin, was highly expressed in synovial tissue from RA patients, further substantiating a potential role for HSPB8 during the inflammatory process in RA. For this study, a total of seven RA patients attending the Department of Rheumatology at Radboud University Nijmegen Medical Center and seven healthy volunteers were included. The patients fulfilled the American College of Rheumatology criteria for RA (29), and they all gave their informed consent. Patients using high-dose prednisolone (>10 mg/day) or anticytokine therapies (anti-TNF-α and/or IL-1Ra) were excluded from this study. For immunohistochemical analysis, synovial biopsies from RA patients (n = 5) were obtained using small needle arthroscopy. On average, 20 biopsy samples were obtained from the medial and lateral suprapattelar pouch on each occasion. The local Medical Ethics Committee approved the study protocol. For the expression of the different sHSPs, pET16b constructs were used containing the coding sequence of human αA crystallin, αB crystallin, HSPB8, HSP27, or rat HSP20. Expression of each protein was induced in Rosetta (DE3)pLysS cells (Novagen) for 3 h at 37°C with 0.4 mM isopropyl β-d-1-thiogalactopyranoside. Cells were spun down from four cultures of 450 ml and resuspended in 20 ml of 25 mM Tris-HCl, 2 mM EDTA, and 50 mM glucose) (TEG50), pH 8.0, containing protease inhibitors (one complete protease inhibitor mixture tablet; Roche). The cell suspension was frozen, thawed, and sonicated three times for 30 s. The suspension was cleared by centrifugation, and the supernatant was desalted with a HiTrap 26/10 column (Amersham Biosciences) in 25 mM Tris-HCl and 2 mM EDTA) (TE), pH 7.0. The different sHSPs were purified over a DEAE-Sepharose fast-flow column and Source 15Q column (Amersham Biosciences) at room temperature and a flow rate of 2 ml/min, using a gradient from 0 to 1000 mM NaCl in TE (pH 7.0). Monocyte-derived DCs were cultured essentially the same as described previously (30). Briefly, PBMC were isolated from heparinized venous blood by using density-gradient centrifugation over Ficoll-Paque (Amersham Biosciences). Low-density cells were collected and washed with citrated PBS 5% FCS, whereafter the cells were allowed to adhere for 1 h at 37°C in RPMI 1640 Dutch modification (Invitrogen Life Technologies) supplemented with 2% human serum (PAA Laboratories) in 25-cm2 cell culture flasks (Corning). Adherent monocytes were cultured in RPMI 1640 Dutch modification supplemented with 10% FCS and antibiotic-antimycotic (Invitrogen Life Technologies) in the presence of IL-4 (500 U/ml; Schering-Plough) and GM-CSF (800 U/ml; Schering-Plough) for 6 days. Fresh culture medium with the same supplements was added at day 3 where after iDCs were harvested at day 6. The iDCs were resuspended in fresh cytokine-containing culture medium and transferred to culture plates in a concentration of 0.5 × 106 cells/ml and stimulated as described in the subsequent section. 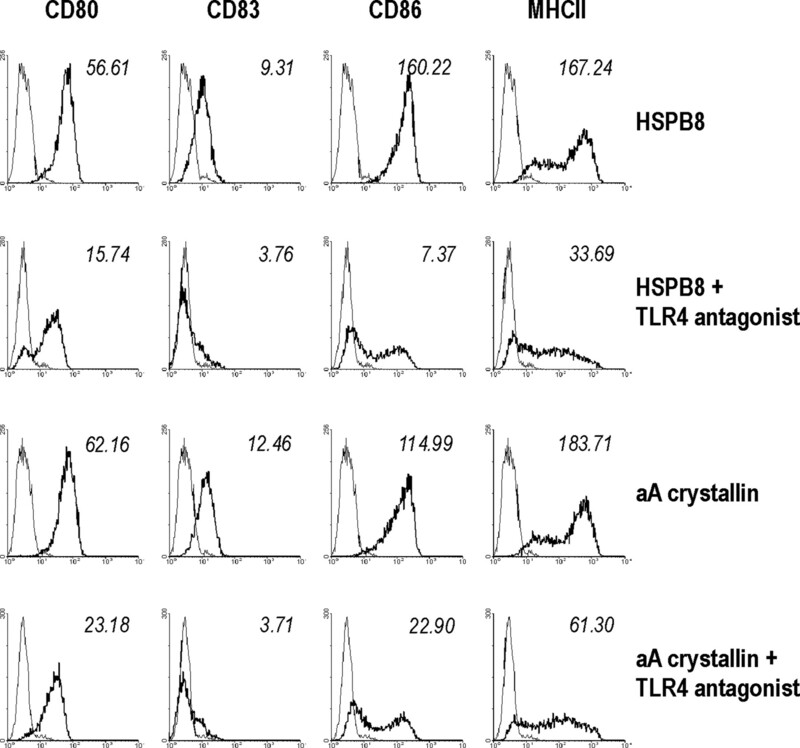 Monocyte-derived iDCs were stimulated with 1 and 10 μg/ml each of these five members of the sHSP family; αA crystallin, αB crystallin, HSPB8, HSP27, HSP20. LPS (Sigma-Aldrich) stimulation (2 μg/ml) was used as a positive control for inducing DC maturation. To correct for potential endotoxin contamination 10 μg/ml polymyxin B (PMB) was added. Furthermore, the sHSPs in the presence of PMB were also tested for the presence of Gram-negative bacterial endotoxin by the Limulus amebocyte lysate (LAL) test, performed according to the manufacturer’s instructions (Multitest LAL Pyrogen Plus; BioWhittaker). Moreover, we also performed experiments with heat-inactivated HPSB8 and αA crystallin. To test the involvement of TLR4 in stimulation with these sHSPs, 100 nM TLR4 antagonist (E5564; provided by the Eisai Research Institute, Andover, MA) was added to the culture (31). After 24 h of culture at 37°C in the presence of 5% CO2, culture supernatants were collected. Supernatants were stored at −20°C until cytokines measurement was performed. BALB/c TLR4-deficient (TLR4−/−) mice were provided by S. Akira (Osaka University, Osaka, Japan). Peritoneal macrophages from TLR4−/− and wild-type mice (both BALB/cA background) were isolated by peritoneal lavage using ice-cold DMEM/10% FCS. Cells were put into 24-well-plates (Corning) at a concentration of 1 × 106 cells/ml. After a 4-day adjustment period, culture medium was changed to one containing 10 μg/ml HSPB8 or control medium. To correct for potential endotoxin contamination, medium contained 10 μg/ml PMB. After 24 h, the culture medium was collected and stored at −20°C until cytokine measurement was performed. The phenotypical analysis of monocyte-derived DCs was performed using standardized flow cytometry protocols as described previously (30). Briefly, a number of 1 × 105 DCs were incubated with mAbs against human CD14 (DakoCytomation), CD80 (BD Biosciences), CD83 (Beckman Coulter), CD86 (BD Pharmingen), MHC class I (MHC-I) (clone W6/32), and MHC-II DR/DP (clone Q1514) for 30 min at 4°C. Cells were then washed and incubated with FITC-conjugated goat anti-mouse IgG (Zymed Laboratories) for 30 min at 4°C in complete darkness. Subsequently, cells were washed and analyzed with a fluorescence-activated cell sorter (FACSCalibur; BD Biosciences) for the proportion of positive cells relative to cells stained with relevant IgG isotypes. Cells were gated according to their forward- and side-scattering patterns. For each marker, 104 cells were counted in the gate. Human TNF-α, IL-6, IL-10, IL-12p70, and mice IL-6 levels were measured in the supernatant of the DC cultures and the peritoneal macrophage cultures, respectively, using commercially available kits (Bio-Rad) according to the manufacturer’s instructions (32). Cytokine levels were measured and analyzed with the Bio-Plex system and its software (Bio-Rad). The sensitivity of the cytokine assay was <5 pg/ml for all cytokines measured. Synovial tissue samples containing 50 μg of synovium proteins together with 10 ng αA crystallin or HSPB8 were subjected to SDS-PAGE and transferred to nitrocellulose membranes (Hybond; Amersham Biosciences). Membranes were then blocked with 5% nonfat dried milk in TBST (15 mM Tris-HCL (pH 8.0), 150 mM NaCl, 0.1% Tween 20) and probed with primary rabbit anti-HspB8 serum or rabbit anti-αA-serum and secondary swine-anti-rabbit peroxidase-coupled Abs. Immunoreactive bands were visualized by the ECL Western blotting detection kit (Pierce). Synovial tissue samples were embedded in Tissue Tek OCT (Sakura) and snap-frozen in liquid nitrogen. Cryostat sections (5 μm) were mounted on superfrost slides and stored at −80°C until processing. For HSPB8 staining, sections were incubated with 2 μg/ml goat anti-human HSPB8 (Abcam) for 60 min. After this, endogenous peroxidase was blocked with 0.3% H2O2 in methanol for 15 min, and the secondary Ab, biotinylated mouse anti-goat IgG (Jackson ImmunoResearch Laboratories), was incubated for 30 min. Vectastain ABC reagent (Vector Laboratories) was incubated for 30 min, developed with diaminobenzidine (Sigma-Aldrich), and counterstained with hematoxylin for 30 s.
For αA crystallin staining, sections were incubated with rabbit anti-human αA crystallin serum (50× diluted) for 60 min. After this, endogenous peroxidase was blocked with 0.3% H2O2 in methanol for 15 min and the secondary Ab, biotinylated swine anti-rabbit IgG (Dako), was incubated for 30 min. Subsequently, slides were incubated with streptavidin-HRP (Dako) for 30 min, developed with diaminobenzidine (Sigma-Aldrich), and counterstained with hematoxylin for 30 s.
To study the potency of sHSP to induce DC maturation, we compared iDC stimulation using 5 different sHSP (αA crystallin, αB crystallin, HSPB8, HSP27, and HSP20) to TLR4-mediated DC maturation using LPS. The iDCs are characterized by the absence of CD14, low levels of CD83, and intermediate levels of the costimulatory molecules CD80 and CD86 and MHC molecules. LPS-mediated DC maturation is characterized by a clear up-regulation of CD83, the costimulatory molecules CD80 and CD86, and MHC molecules (Table I⇓). In our experiments, stimulation with αA crystallin and HSPB8 induced a clear DC maturation as seen by the absence of CD14 and high mean levels of CD80, CD83, CD86, and MHC-II, which was comparable to LPS-mediated stimulation (CD83 and CD86 expression from a representative healthy individual; Fig. 1⇓) In contrast, stimulation with the sHSP αB crystallin, HSP20, and HSP27 did not affect the phenotype of iDCs at all (Fig. 1⇓). Expression of cell surface markers CD83 and CD86 after stimulation with several sHSPs. FACS analysis of the indicated markers (bold line) or isotype controls (thin line) from DCs within the life gate. Human monocyte-derived DCs were stimulated with 10 μg/ml αA crystallin, αB crystallin, HSPB8, HSP27, HSP20, 2 μg/ml LPS, or medium for 48 h.
In addition, we studied whether differences between RA DCs and DCs from healthy controls exist. The sHSP αA crystallin and HSPB8 induced maturation of RA DCs to an equal extent, compared with that seen in control DC (data not shown). To correct for potential endotoxin contamination, experiments were performed in the presence of PMB. Only small differences in FACS results were observed when cultured with or without PMB (data not shown). DC maturation by TLR ligands is known to be accompanied by an increased production of proinflammatory cytokines. Therefore, we investigated whether phenotypic maturation of DCs induced by αA crystallin and HSPB8 coincided with an increased production of the inflammatory mediators TNF-α, IL-6, IL-10, and IL-12p70 as seen in LPS-mediated DC maturation (3, 33). As shown in Fig. 2⇓, 10 μg/ml αA crystallin and HSPB8 clearly induced secretion of IL-6, TNF-α, and to a lesser extent, IL-10 and IL-12p70, and resembled the cytokine pattern induced by LPS stimulation. In contrast with this, but in line with our phenotypical data, αB crystallin, HSP27, and HSP20 hardly induced cytokines. Cytokine production by DCs from RA patients and healthy controls after stimulation with several sHSPs. Mean production of IL-6 (A), TNF-α (B), IL-10 (C), and IL-12p70 (D) by DCs from RA patients (▪) and healthy controls (▦) upon stimulation with 10 μg/ml αA crystallin, αB crystallin, HSPB8, HSP27, HSP20, 2 μg/ml LPS, or medium for 24 h (αA crystallin and HSPB8, n = 7; for other small HSP, n = 3). Error bars represent the SEM. The sensitivity of the cytokine assay was <5 pg/ml for each measured cytokine. Interestingly, although not statistically significant, cytokine levels produced by RA cells were markedly increased, compared with the cytokine levels produced by DCs from healthy controls upon stimulation with αA crystallin and HSPB8 (IL-6 ∼13,000 pg/ml; TNF-α ∼8,500 pg/ml). Although the absolute cytokine levels produced by RA cells were markedly increased, the shape of the TLR-sHSP dose-response curves were similar for RA cells as well as cells from healthy controls. These results exclude that the differences in cytokine production are a result of different shapes of dose-response curves. As tested by dose-response experiments, both HSP were able to activate DC in a concentration as from 50 ng HSP/ml, resulting in production of IL-6 (data not shown). Again, hardly any effect with regard to cytokine production was observed upon coculture with αB crystallin, HSP27, and HSP20 (Fig. 2⇑). To correct for potential endotoxin contamination, we performed all the cell stimulation experiments in the presence of PMB; however, addition of PMB only slightly decreased the sHSP-mediated cytokine production, indicating that hardly any endotoxins were present in our sHSP preparations. In addition, we performed experiments with heat-inactivated HSPB8 and αA crystallin, which showed a significant reduction in TNFα production (98% reduction), excluding that endotoxin contamination played a role in our experiments. Many studies refer to the potential role of TLR4 in the recognition of HSP, their role in DC maturation, and the potential implication for TLRs in the pathogenesis of arthritis. Therefore, we studied whether TLR4 was involved in DC activation by HSP crystallin and HSPB8. To this aim, we stimulated DCs with αA crystallin and HSPB8 in the presence and absence of a TLR4 antagonist (E5564) (31). With respect to DC maturation, adding a TLR4 antagonist clearly inhibits DC maturation, as seen by a clear decrease in the expression of CD80, CD83, CD86, and MHC-II (Fig. 3⇓). In line with this finding, the production of IL-6 (∼80% decrease), TNF-α (∼85% decrease), IL-10 (∼70% decrease), and IL-12p70 (∼80% decrease) by DCs from healthy individuals was markedly reduced by the addition of a TLR4 antagonist (Fig. 4⇓). Although somewhat less clear, this effect was demonstrated for DCs from RA patients as well (IL-6, ∼60% decrease; TNF-α, ∼65% decrease; IL-10, ∼80% decrease; and IL-12p70, ∼85% decrease). Expression of cell surface markers CD80, CD83, CD86, and MCHII after stimulation with HSPB8 in the presence and absence of a TLR4 antagonist. FACS analysis of the indicated markers (bold line) or isotype controls (thin line) from DC within the life gate. Human monocyte-derived DCs were stimulated with 10 μg/ml HSPB8 for 48 h in the presence or absence of a TLR4 antagonist (E5564). Cytokine production by DCs from RA patients and healthy controls after stimulation with αA-crystallin and HSPB8 in the presence or absence of a TLR4 antagonist. 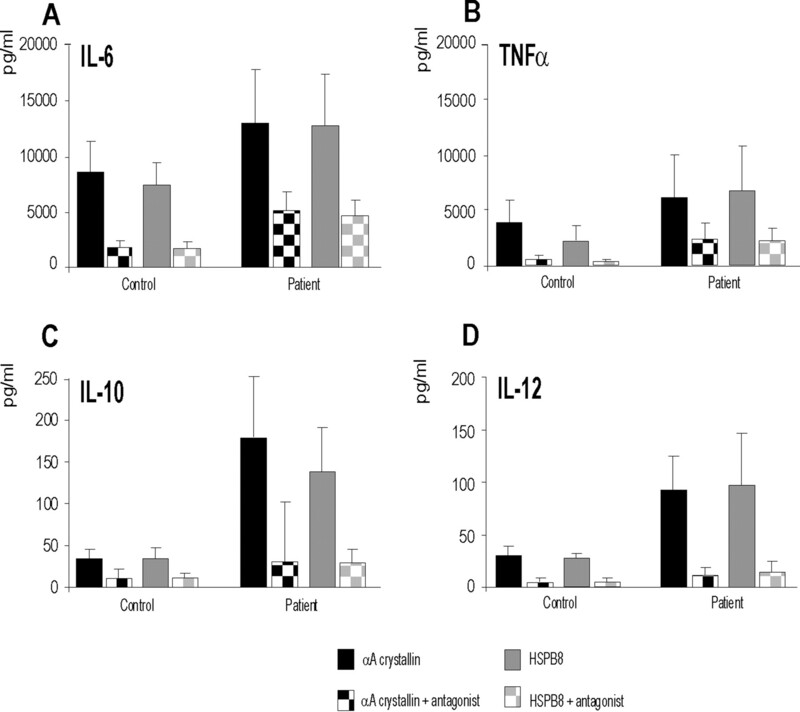 Mean production of IL-6 (A), TNF-α (B), IL-10 (C), and IL-12p70 (D) by DCs from RA patients and healthy controls upon stimulation with 10 μg/ml αA crystallin or HSPB8 for 24 h (n = 5). Cells were cultured in the presence (checked bars) or absence (plain bars) of 100 nM TLR 4 antagonist (E5564). The values showed were corrected for the cytokine production by unstimulated DCs. Error bars represent the SEM. The sensitivity of the cytokine assay was <5 pg/ml for each measured cytokine. To further confirm the TLR4 dependency of HSPB8 stimulation, we stimulated peritoneal macrophages of wild-type and TLR4−/− mice with HSPB8-containing medium or medium alone. In both wild-type macrophages as well as TLR4−/− macrophages, medium did not induce the production of IL-6. As expected, and confirming our previous data, HSPB8 stimulation of wild-type macrophages resulted in a markedly increased production of IL-6 The production of other cytokines (TNF-α and IL-10) was below detection level. The almost complete abrogation of IL-6 production by peritoneal macrophages from TLR4−/− mice further confirms the TLR4 dependency of HSPB8-mediated cell activation (Fig. 5⇓). 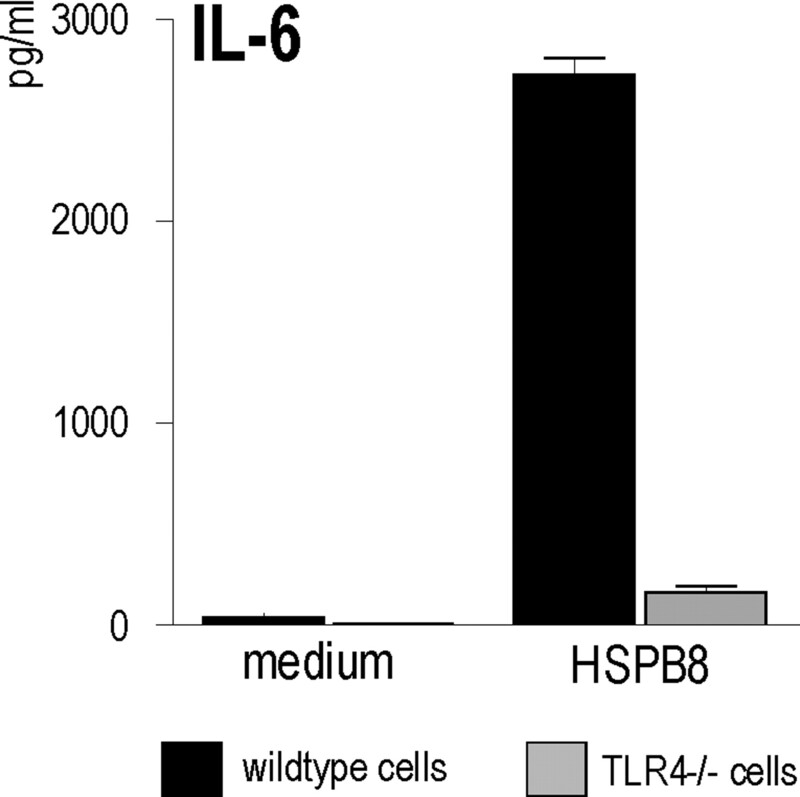 IL-6 production by peritoneal macrophages from TLR4−/− mice and wild-type mice upon stimulation with HSPB8. Mean IL-6 production by peritoneal macrophages from TLR4−/− (n = 7) and wild-type (n = 7) mice after incubation with 10 μg/ml HSPB8 for 24 h. The sensitivity of the cytokine assay was <5 pg/ml. Thus far, the main expression of αA crystallin and HSPB8 in human tissues was confined to the eye lens, skeletal muscle, heart, and placenta (34). To study the potential role for sHSPs in synovial inflammation, we tested the expression of αA crystallin and HSPB8 in RA synovium using Western blotting and immunohistochemistry techniques. Interestingly, Western blotting showed clear staining for of HSPB8 in RA synovial tissue, whereas αA crystallin staining was completely absent (Fig. 6⇓). Western blot detection of HSPB8 and αA crystallin in synovial tissue from RA patients. Synovial tissue samples (n = 3) were analyzed for the expression of HSPB8 and αA crystallin (open arrows). As a positive control, rHSPB8 and rαA crystallin were used. The black arrow indicates a modified form of HSPB8. Additional immunohistochemistry showed that the expression of HSPB8 was particularly present in the lining (Fig. 7⇓B) and the vascular endothelial (Fig. 7D⇓) cells. HSPB8 also was expressed in the sublining, albeit to a lesser extent. 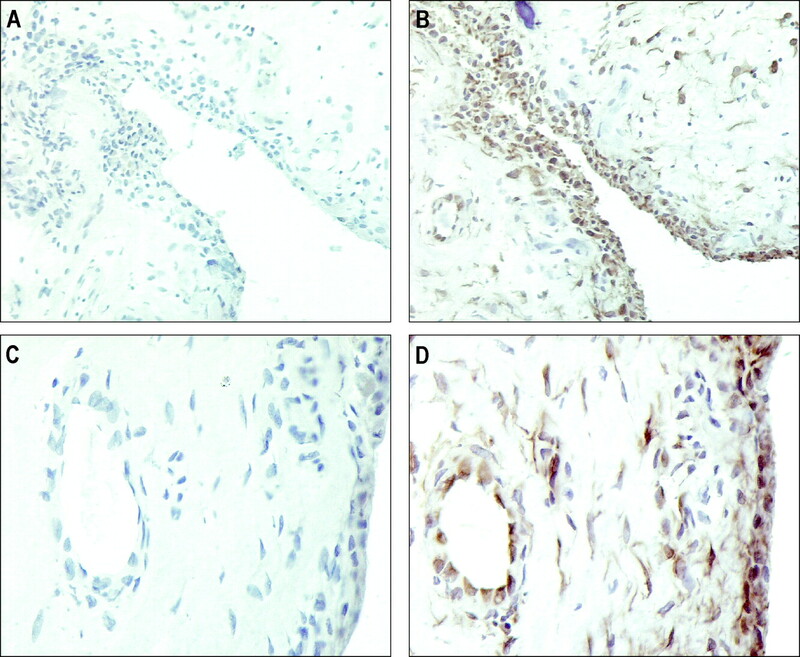 Immunohistochemical detection of HSPB8 in synovial tissue from RA patients. A, Staining of the synovial lining with an isotype control Ab (magnification ×200). B, Staining of the synovial lining with a specific Ab against HSPB8 (magnification ×200). C, Staining of synovial vascular endothelial cells with an isotype control Ab (magnification ×400). D, Staining of synovial vascular endothelial cells with a specific Ab against HSPB8 (magnification ×400). All synovial tissue sections were counterstained with hematoxylin. Ag recognition by TLRs results in activation of the innate immune system and leads to the secretion of many inflammatory mediators such as TNF-α, IL-6, and several chemokines. Therefore, the innate immunity is likely to play a considerable role both in the initiation and perpetuation of the inflammatory processes during RA. In this study, we demonstrated that two members of the sHSP family, αA crystallin and HSPB8, were able to activate DCs by inducing maturation and cytokine production. Blockade of TLR4, using a selective TLR4 antagonist (E5564) (31), clearly abrogated this effect, demonstrating the TLR4 dependency of this HSP stimulation. In line with this finding, incubation of peritoneal macrophages from TLR4−/− mice, with HSPB8 and αA crystallin, did barely lead to the production of inflammatory cytokines, whereas wild-type mice clearly did show an increased cytokine production. Finally, we provided evidence for a role of HSPB8 in the pathogenesis of RA by demonstrating that HSPB8, but not αA crystallin, was highly present in RA synovial tissue. Lately, an increasing amount of literature points to a role for TLRs in the recognition of host-derived molecules, such as hyaluronan, fibronectin fragments, HSPs, mRNA from necrotic cells, and mammalian chromatin (9, 10, 11, 12, 35). However, recently it has been shown that the stimulating effect some of these endogenous TLR ligands is caused by endotoxin contamination and not by the ligand itself (36, 37). To exclude the possibility that LPS contamination interfered with our experiments, we performed all the stimulation experiments in the presence and absence of PMB, a natural LPS binding protein. Second, we tested the presence of LPS using the LAL test, which showed to be negative for all five HSP samples tested. Furthermore, experiments with heat-inactivated HSPB8 and αA crystallin showed a significant decrease in TNF-α production, excluding the involvement of endotoxins in the TLR4-mediated DC activation. Finally, all five HSP tested were simultaneously prepared using the same protocols. The fact that DC maturation and activation could be achieved only by incubation with HSPB8 and αA crystallin underscores the fact that an effect of endotoxins could be ruled out. The ability of HSPB8 and αA crystallin to activate cells using TLR4 is intriguing because we and others found that TLRs are highly expressed in RA synovial tissue (3, 4, 19, 38). We also found that, upon stimulation of TLR2 and TLR4, DCs from RA patients produce significantly higher amounts of proinflammatory cytokines, compared with DCs from healthy controls (3). Additionally, models of experimental arthritis support the role for TLRs in this inflammatory disease (20, 39). Furthermore, the involvement of TLRs in tolerance breakthrough has been demonstrated in experimental models of diabetes and multiple sclerosis (14, 16, 17). Therefore, our finding that HSPB8 is abundantly expressed in the synovial tissue of RA patients underscores that HSPB8 could act as a TLR4 ligand during RA, thereby amplifying the inflammatory loop. Because recent literature shows that simultaneous stimulation of TLRs might be the event that sets of autoimmunity, it is tempting to speculate that HSPB8, together with other endogenous TLR ligands, which are released in the synovial compartment, are involved in this process (3, 40). The expression of HSPB8 in human tissues, particularly in skeletal and smooth muscles, heart, and brain, has been described well (34, 41). The finding that HSPB8 also is expressed in synovial tissue is new and could be explained by the fact that synovial tissue is normally not part of the tissue data bank used to screen the tissue distribution of new proteins. In conclusion, we identified two new TLR4 agonists, HSPB8 and αA crystallin. HSPB8 is highly expressed in RA synovial tissue and is likely to be released during synovial inflammation. The release of this protein in the synovial joint could potentially lead to an ungoing activation of inflammatory cells, thereby amplifying the inflammatory loop of synovial inflammation. Further research is necessary to elucidate the precise role of HSPB8 in the pathogenesis of RA. We thank T. van Lieshout and M. Wenink for collecting blood from RA patients and healthy controls. ↵1 This work was supported by research grants from Foundation De Drie Lichten and European League Against Rheumatism Young Investigator Award 2003. ↵3 Abbreviations used in this paper: RA: rheumatoid arthritis; DC: dendritic cell; iDC, immature DC; HSP, heat shock protein; sHSP: small HSP; PMB, polymyxin B; MHC-I, MHC class I.. Page, G., S. Lebecque, P. Miossec. 2002. Anatomic localization of immature and mature dendritic cells in an ectopic lymphoid organ: correlation with selective chemokine expression in rheumatoid synovium. J. Immunol. 168: 5333-5341. Pettit, A. R., K. P. MacDonald, B. O’Sullivan, R. Thomas. 2000. Differentiated dendritic cells expressing nuclear RelB are predominantly located in rheumatoid synovial tissue perivascular mononuclear cell aggregates. Arthritis Rheum. 43: 791-800. Roelofs, M. F., L. A. Joosten, S. Abdollahi-Roodsaz, A. W. van Lieshout, T. Sprong, F. H. van den Hoogen, W. B. van den Berg, T. R. Radstake. 2005. The expression of toll-like receptors 3 and 7 in rheumatoid arthritis synovium is increased and costimulation of toll-like receptors 3, 4, and 7/8 results in synergistic cytokine production by dendritic cells. Arthritis Rheum. 52: 2313-2322. Schwandner, R., R. Dziarski, H. Wesche, M. Rothe, C. J. Kirschning. 1999. Peptidoglycan- and lipoteichoic acid-induced cell activation is mediated by toll-like receptor 2. J. Biol. Chem. 274: 17406-17409. Hoshino, K., O. Takeuchi, T. Kawai, H. Sanjo, T. Ogawa, Y. Takeda, K. Takeda, S. Akira. 1999. Cutting edge: Toll-like receptor 4 (TLR4)-deficient mice are hyporesponsive to lipopolysaccharide: evidence for TLR4 as the LPS gene product. J. Immunol. 162: 3749-3752. Termeer, C., F. Benedix, J. Sleeman, C. Fieber, U. Voith, T. Ahrens, K. Miyake, M. Freudenberg, C. Galanos, J. C. Simon. 2002. Oligosaccharides of Hyaluronan activate dendritic cells via toll-like receptor 4. J. Exp. Med. 195: 99-111. Okamura, Y., M. Watari, E. S. Jerud, D. W. Young, S. T. Ishizaka, J. Rose, J. C. Chow, J. F. Strauss, III. 2001. The extra domain A of fibronectin activates Toll-like receptor 4. J. Biol. Chem. 276: 10229-10233. Ohashi, K., V. Burkart, S. Flohe, H. Kolb. 2000. Heat shock protein 60 is a putative endogenous ligand of the toll-like receptor-4 complex. J. Immunol. 164: 558-561. Kariko, K., H. Ni, J. Capodici, M. Lamphier, D. Weissman. 2004. mRNA is an endogenous ligand for Toll-like receptor 3. J. Biol. Chem. 279: 12542-12550. Zipris, D., E. Lien, J. X. Xie, D. L. Greiner, J. P. Mordes, A. A. Rossini. 2005. TLR activation synergizes with Kilham rat virus infection to induce diabetes in BBDR rats. J. Immunol. 174: 131-142. Kobayashi, M., M. N. Kweon, H. Kuwata, R. D. Schreiber, H. Kiyono, K. Takeda, S. Akira. 2003. Toll-like receptor-dependent production of IL-12p40 causes chronic enterocolitis in myeloid cell-specific Stat3-deficient mice. J. Clin. Invest. 111: 1297-1308. Visser, L., H. H. Jan de, L. A. Boven, R. D. van, M. M. van, M. J. Melief, U. Zahringer, S. J. van, B. N. Lambrecht, E. E. Nieuwenhuis, J. D. Laman. 2005. Proinflammatory bacterial peptidoglycan as a cofactor for the development of central nervous system autoimmune disease. J. Immunol. 174: 808-816. Waldner, H., M. Collins, V. K. Kuchroo. 2004. Activation of antigen-presenting cells by microbial products breaks self tolerance and induces autoimmune disease. J. Clin. Invest. 113: 990-997. Hamilton-Williams, E. E., A. Lang, D. Benke, G. M. Davey, K. H. Wiesmuller, C. Kurts. 2005. Cutting edge: TLR ligands are not sufficient to break cross-tolerance to self-antigens. J. Immunol. 174: 1159-1163. Seibl, R., T. Birchler, S. Loeliger, J. P. Hossle, R. E. Gay, T. Saurenmann, B. A. Michel, R. A. Seger, S. Gay, R. P. Lauener. 2003. Expression and regulation of Toll-like receptor 2 in rheumatoid arthritis synovium. J. Am. Pathol. 162: 1221-1227. Joosten, L. A., M. I. Koenders, R. L. Smeets, M. Heuvelmans-Jacobs, M. M. Helsen, K. Takeda, S. Akira, E. Lubberts, F. A. van de Loo, W. B. van den Berg. 2003. Toll-like receptor 2 pathway drives streptococcal cell wall-induced joint inflammation: critical role of myeloid differentiation factor 88. J. Immunol. 171: 6145-6153. Lee, E. K., S. M. Kang, D. J. Paik, J. M. Kim, J. Youn. 2005. Essential roles of Toll-like receptor-4 signaling in arthritis induced by type II collagen antibody and LPS. Int. Immunol. 17: 325-333. Zare, F., M. Bokarewa, N. Nenonen, T. Bergstrom, L. Alexopoulou, R. A. Flavell, A. Tarkowski. 2004. Arthritogenic properties of double-stranded (viral) RNA. J. Immunol. 172: 5656-5663. Gallucci, S., M. Lolkema, P. Matzinger. 1999. Natura adjuvants: endogenous activators of dendritic cells. Nat. Med. 5: 1249-1255.
van Eden, W., A. Koets, P. van Kooten, B. Prakken, R. van der Zee. 2003. Immunopotentiating heat shock proteins: negotiators between innate danger and control of autoimmunity. Vaccine 21: 897-901.
van Eden, W., R. van der Zee, B. Prakken. 2005. Heat-shock proteins induce T-cell regulation of chronic inflammation. Nat. Rev. Immunol. 5: 318-330. De Jong, W. W., J. A. Leunissen, C. E. Voorter. 1993. Evolution of the α-crystallin/small heat-shock protein family. Mol. Biol. Evol. 10: 103-126. MacRae, T. H.. 2000. Structure and function of small heat shock/α-crystallin proteins: established concepts and emerging ideas. Cell Mol. Life Sci. 57: 899-913. Narberhaus, F.. 2002. α-crystallin-type heat shock proteins: socializing minichaperones in the context of a multichaperone network. Microbiol. Mol. Biol. Rev. 66: 64-93. Arnett, F. C., S. M. Edworthy, D. A. Bloch, D. J. McShane, J. F. Fries, N. S. Cooper, L. A. Healey, S. R. Kaplan, M. H. Liang, H. S. Luthra. 1988. The American Rheumatism Association 1987 revised criteria for the classification of rheumatoid arthritis. Arthritis Rheum. 31: 315-324. Radstake, T. R., A. B. Blom, A. W. Sloetjes, E. O. van Gorselen, G. J. Pesman, L. Engelen, R. Torensma, W. B. van den Berg, C. G. Figdor, P. L. van Lent, et al 2004. Increased FcγRII expression and aberrant tumor necrosis factor α production by mature dendritic cells from patients with active rheumatoid arthritis. Ann. Rheum. Dis. 63: 1556-1563. Mullarkey, M., J. R. Rose, J. Bristol, T. Kawata, A. Kimura, S. Kobayashi, M. Przetak, J. Chow, F. Gusovsky, W. J. Christ, D. P. Rossignol. 2003. Inhibition of endotoxin response by e5564, a novel Toll-like receptor 4-directed endotoxin antagonist. J. Pharmacol. Exp. Ther. 304: 1093-1102. De Jager, W., H. te Velthius, B. J. Prakken, W. Kuis, G. T. Rijkers. 2003. Simultaneous detection of 15 human cytokines in a single sample of stimulated peripheral blood mononuclear cells. Clin. Diagn. Lab Immunol. 10: 133-139. Radstake, T. R., P. L. van Lent, G. J. Pesman, A. B. Blom, F. G. Sweep, J. Ronnelid, G. J. Adema, P. Barrera, W. B. van den Berg. 2004. 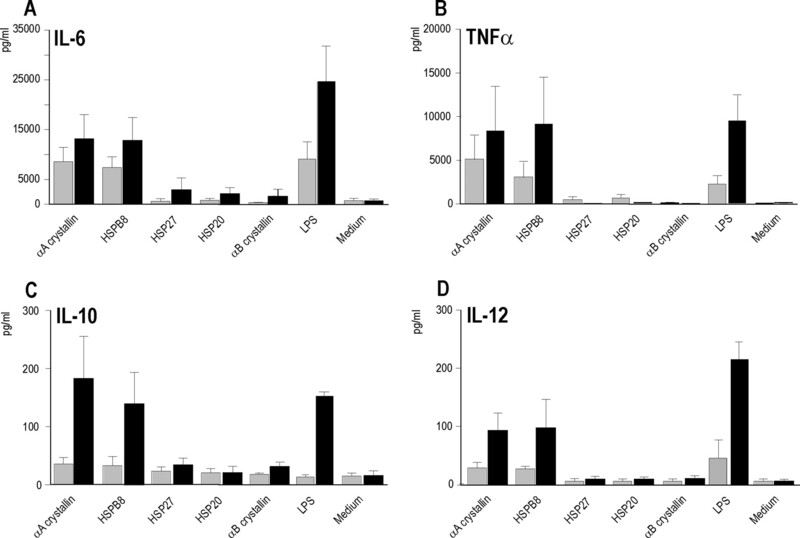 High production of proinflammatory and Th1 cytokines by dendritic cells from patients with rheumatoid arthritis, and down regulation upon FcγR triggering. Ann. Rheum. Dis. 63: 696-702. Kappe, G., P. Verschuure, R. L. Philipsen, A. A. Staalduinen, B. P. Van de, W. C. Boelens, W. W. De Jong. 2001. Characterization of two novel human small heat shock proteins: protein kinase-related HspB8 and testis-specific HspB9. Biochim. Biophys. Acta 1520: 1-6. Leadbetter, E. A., I. R. Rifkin, A. M. Hohlbaum, B. C. Beaudette, M. J. Shlomchik, A. Marshak-Rothstein. 2002. Chromatin-IgG complexes activate B cells by dual engagement of IgM and Toll-like receptors. Nature 416: 603-607. Gao, B., M. F. Tsan. 2003. Recombinant human heat shock protein 60 does not induce the release of tumor necrosis factor α from murine macrophages. J. Biol. Chem. 278: 22523-22529. Bausinger, H., D. Lipsker, U. Ziylan, S. Manie, J. P. Briand, J. P. Cazenave, S. Muller, J. F. Haeuw, C. Ravanat, S. H. de la, D. Hanau. 2002. Endotoxin-free heat-shock protein 70 fails to induce APC activation. Eur. J. Immunol. 32: 3708-3713. Kyo, F., H. Futani, K. Matsui, M. Terada, K. Adachi, K. Nagata, H. Sano, H. Tateishi, H. Tsutsui, K. Nakanishi. 2005. Endogenous interleukin-6, but not tumor necrosis factor α, contributes to the development of toll-like receptor 4/myeloid differentiation factor 88-mediated acute arthritis in mice. Arthritis Rheum. 52: 2530-2540. Napolitani, G., A. Rinaldi, F. Bertoni, F. Sallusto, A. Lanzavecchia. 2005. Selected Toll-like receptor agonist combinations synergistically trigger a T helper type 1-polarizing program in dendritic cells. Nat. Immunol. 6: 769-776. Benndorf, R., X. Sun, R. R. Gilmont, K. J. Biederman, M. P. Molloy, C. W. Goodmurphy, H. Cheng, P. C. Andrews, M. J. Welsh. 2001. HSP22, a new member of the small heat shock protein superfamily, interacts with mimic of phosphorylated HSP27 ((3D)HSP27). J. Biol. Chem. 276: 26753-26761.